Yesterday I did my first sale at the garage. My plan was to post about it here beforehand but I ended up running out of time. I’ve been pretty busy picking these past few weeks, and I’ve also spent a lot of time organizing my jam-packed space in anticipation of the sale, not to mention my move to a smaller garage in July. Things were pretty good if relatively quiet for the first hours. My friend Sarah was helping and a bunch of fun people came as a result of my Instagram stories. At one point a garbage truck stopped and the workers came and bought a few things. I didn’t tell them that everything was former trash! I was adding to an Instagram story during the sale, which is why the next two photos have writing on them. At some point however things got a bit nuts. My friend needed to leave earlier in the day so I had to manage all the stuff (more than I’ve had at any other sale previously) and all the space by myself. Around 4:30 a group of three people showed up, all of whom made big piles of stuff and had no interest in paying anything near a fair price. I tried to be nice and bargain with them; I realized later that this was a mistake. They ended up making bigger and bigger piles and driving harder “bargains” – they seemed to feel entitled to more stuff because they had spent “so much” on the things they actually bought. At about the same time a couple in a car showed up and started tearing things apart in the back. It was kind of a mess back there to start so I guess they didn’t think it was a big deal to make a bigger one. I could hear a glass thing or two break from my seat on the sidewalk, but since I was trying to dealing with the group of three ladies there wasn’t much I could do. At least those folks paid reasonable prices, but between the two groups my space is now a complete disaster zone. At a certain point I realized I had lost control over the situation. My solution was to kick everyone out and end the yard sale early (it started raining not long after, so at least the timing of this was good). I was pretty peeved at this point so I wasn’t particularly friendly while doing it! I’m sure those ladies stole a fair bit of stuff from me – at the very least I saw one of them walk off with a nice banker style lamp that she hadn’t paid for – but I wasn’t going to fight them over trash and what is ultimately chump change. Besides, I think they helped teach me a lesson that will prove valuable in future sales. Occasionally folks will come and feel entitled to pay nothing for quality stuff, and sometimes those people will be extremely insistent. At this sale (and in the past) I tried to be nice and attempt to bargain, but I think by doing so I only encouraged them to push the limits even further. The situation really degenerated once they realized that I wasn’t going to stand up for myself or the value of my items. One of my favourite aspects about yard sales is getting rid of things. I love junk, but at the same time I don’t like it hanging around for very long. 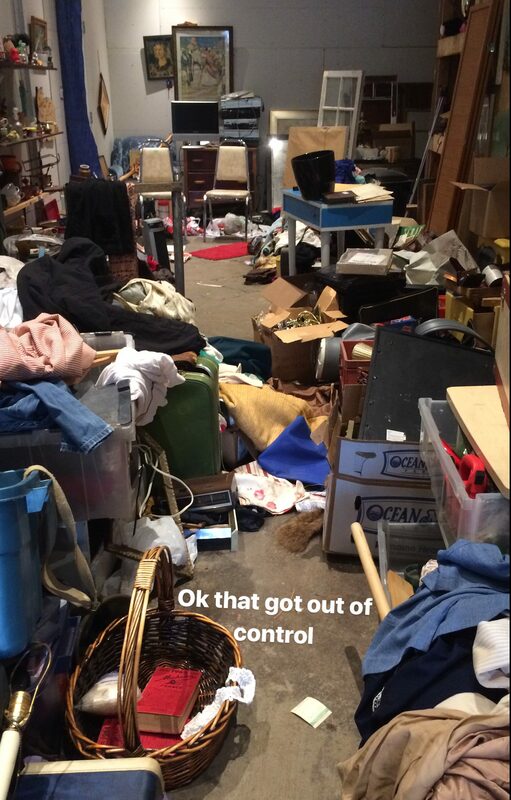 I’m not a minimalist, but having too much stuff definitely stresses me out. So, when people are willing to pay for my finds – even at bargain basement prices – I can console myself with the fact that I’ll never have to think about those items ever again. That, more than anything else is the reason I’ve been willing to negotiate with those who bargain in bad faith. However, I’ll be taking a more hard-line approach going forward. If I think someone is being unreasonable, I’m going to tell them “no”. If they insist, I’ll tell them to leave. If they won’t leave, I’ll call the cops. I love getting rid of things, but I also have to uphold certain principles and demand respect for both myself and my junk. I can always donate the stuff they wanted to “buy” thereby satisfying my desire to never see it again! Beyond the unpleasantness I made okay money (800$). I was hoping for more but I can’t complain too much – I’ll be able to pay the bills at least. Cleaning and re-organization that garage is going to be a lot of work though. Fortunately, a couple of friends and followers have volunteered to help. 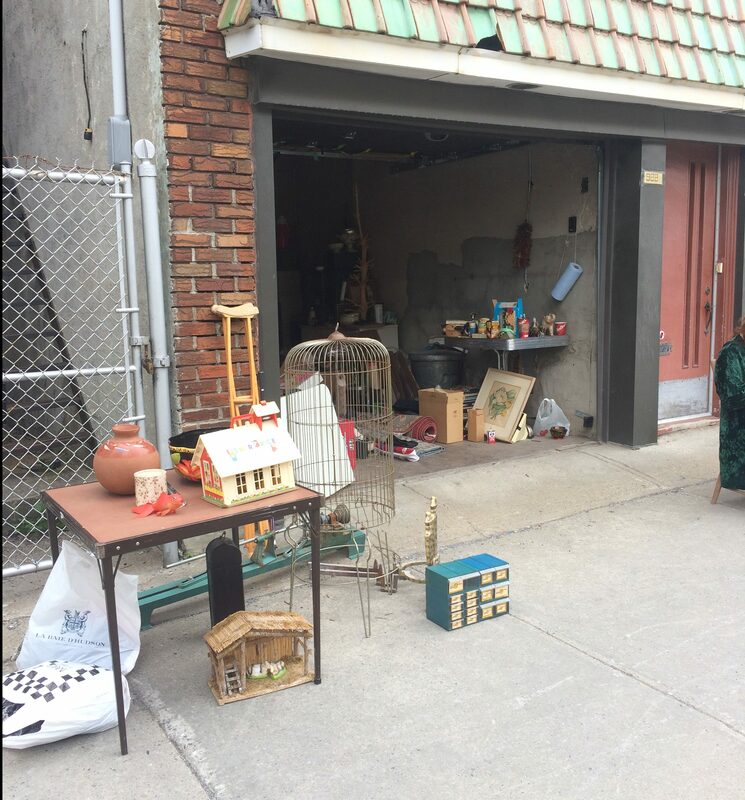 I might have another yard sale next weekend before I switch garages – I guess I’m just a glutton for punishment! I promise to let you know if that’s a go this time. People can certainly be horrid sometimes. I’m glad that at least you were able to make some money! There are rude people everywhere and you just have to stand your ground. We did a church rummage sale and at the last minute some buyers swooped in trying to get stuff for nothing. We did not feel it was in good faith and sold them some things but held our ground on others. I’d rather give it away then let someone bully me. That’s how I’m thinking about it now as well. By standing your ground you also don’t reward their bad behavior. I’d rather make a bit less money! You should not have to be subjected to this bad behavior. You’re well within your rights to refuse a ridiculous price and send them on their way! I’d also recommend having a backup helper because it’s almost impossible to run a sale by yourself. I love your posts and what you do! Indeed, I had a backup for a while but she had to leave early due to unforeseen circumstances. It would have helped to have her around, but I’m not sure I would have learned this lesson otherwise so maybe it’s for the best. I’m so sorry those people were horrible to you. 😦 Do you think they could have been working together? I certainly hope not, but unfortunately some people feel entitled to take things that don’t belong to them. I like watching your finds on Instagram. It’s pretty neat all the good things you find. Perhaps, I didn’t get a pre-planned vibe from the situation but I wouldn’t be surprised if they knew what they were doing. Glad you like my Instagram, I’ve been posted there lots recently because it’s fun and relatively quick / easy. I used to own a retail shop in upstate New York not far from your border. Three women showed up and did the exact same thing as I was going out of business. It might be a thing. A mess and didn’t seem to buy anything at the end, wanted further discounts than half priced, etc. don’t know if stuff was stolen, but made such chaos, it could’ve been. Maybe that’s the point to begin with, chaos while things are stolen. Thanks for letting community know. If I were doing it today and that happened, I would say, “ leave everything where it is and YOU make a list of what you want and what you’re willing to pay.” No piles. Done. That way other customers have access to buy. It’s probably a thing. I think some people feel empowered when they’re in groups, especially when they outnumber the people they’re thinking of exploiting. At the very least the divided attention makes it easier for them to get away with things like stealing or other antisocial behavior. There’s no way I could have kept track of all these people, for instance, so holding them accountable became basically impossible once I made the original concessions. Be strong. Just hold your head up high and smile at these vultures. Tell them in a serious voice that you will take no less than $$$. If they find you hesitate, they swoop in like predators. I do the sales every Saturday for the last 25 years and have seen those types. The ones that steal, the ones that bargain you down till you are exhausted. I wish I was still in Montreal, I would have come to help you. Good luck on your next one. Sorry for the bad experience. Glad you made some money and it will definitely make the move easier! I am having a sale in a few weeks so will have this “pep talk” on my mind as I forge ahead with the sale prep and actual sale. Several years ago, I accompanied an anthropologist on a yard sale expedition. She had a lot of insight into the yard/garage sale culture and it made a great article in the Baltimore Sun. My advice: always, always, have at least one other person there in the back to watch out for thieves, even if you have to pay or trade someone for their time. Since early birds will start at six, it’s wise to close the whole thing down around noon, because that’s when the porch pirates prey on you. I love you page and wish you well in your adventures. What you don’t sell, you can donate to a charity and name your price for a tax deduction. Wow, people can be some real savages, eh? Please tell us of your sale! It seems every time you have one I am out of the city….like yesterday! Don’t be a doormat and let people walk all over you! You worked hard for these treasures! I had a similar experience when I had my store.About 6-8 punkish/grundgy/anachists style kids(20yrs ish) swooped in.The effect was chaos and theft .It was a raid.Before I knew what was going on,it was over and like you a bit wiser. On the other hand ther is an ethnic group in Montreal that can wear you down,they test the patience of a saint.When they’ve bagained you down past your bottom price,they ask for a discout for getting so much for nothing AND THEN ask for something for free ,just for being your customer.In the end your ready to pay them to never show there face again. Sorry for your troubles, and thank you for the education. I’ve had people steal from me at yard sales. Usually I hold my sales with a friend at their house so I am a motivated seller since I don’t want to pack it all up again. Recently I had children shop lift which really takes the cake. I am always willing to bargain but a lot depends on the manner in which I’m asked. Martin, You do this for a living. It’s your retail store They used the “divide and conquer “ bully tactic to distract and steal. Just always have helpers. So sorry you were treated crappily (is that even a word!?). Keep up the good work. I think in the states its a fairly fast rule that the first day or until towards the end of a sale, no one ask s for a “deal”. The assumption is at the end, if things haven’t sold, the seller would rather have some money rather than none, and not have to put stuff back etc. On the last day, during a designated time, church rummage sales. a few estate sales, etc. will have a 50% of everything or everything you can fit in a bag for $10. or $5. This might seem fairer to buyers who want to negotiate, tell them to wait and it its still there you will bargain. This way you seem reasonable and if the buyer wants it badly enough, they will be full fare. It’s psychology people are used to in stores, what’s left gets marked down and it has worked well for me. Argh. So sorry to read about you being treated disrespectfully. Everything you are doing seems (to me at least) to be motivated by a deep respect — for the sustainability of human life on planet earth, for human history, for beautiful things which aren’t ready to become landfill or be incinerated. I agree about standing your ground. And about how bargaining sometimes creates an open door for additional bullying/disrespect. I recently watched a video about how lefty liberals here in the US will often respond to an ignorant and/or mean-spirited and/or provocative comment from someone espousing an alt-right world view by carefully explaining why the comment is not accurate. And this usually turns out to be a huge waste of time. Careful explanation is viewed as weakness and an invitation to lob another incendiary comment into the interaction… Your experiences with certain shoppers also reminds me of a presentation that a district attorney recently shared with residents of my town about all of the different scams (via telephone! in person! texting! email! snail mail!) that are currently being experienced in our community. One them is that as soon as someone agrees to send money to a scammer (who is pretending to represent the IRS OR says she is a lawyer for your grandchild who just got arrested at college for possession of marijuana OR wants to help you collect lottery earnings from a Caribbean Island), the scammer then finds another reason why they need you to send more money. All of the scammers I listed in my previous parentheses managed to get trusting/naive/worried/gullible fellow human beings to send them THOUSANDS of dollars. I agree with everyone else’s comments that you set clear guidelines about what is acceptable and then hold firm to them as much as you (and a large team of helpers!!!) are able. On another note, I love that “At one point a garbage truck stopped and the workers came and bought a few things. I didn’t tell them that everything was former trash!” Well done!!! I hate bargainers at my garage sale. I post a sign saying prices are firm. I price my items fairly and when people try to get a deal I tell them to come back within the last hour and everything will be half price. 90% of the time people will then pay the posted price, they prefer not to lose the item. And for the few customers who leave, I’m ok with that because I later sell item and feel good I got my price and held my ground. This has been my attitude for years, it works! Sorry you had to deal with such difficult customers at your sale. You take time to find, clean and save treasures -that takes effort. It’s worthy of the prices you ask your items. It definitely sounds like the 2 groups were being inconsiderate and taking advantage of the situation that you were working by yourself. Good thinking to just shut the sale down when you felt things were going awry. It’s great that you’ll be more assertive if customers get too pushy with negotiating. Their entitled attitudes for paying nowhere near fair prices is bonkers. It’s one thing to ask for a bit of a discount (nicely) another to assume you will get a big one! And for the stealing bit, they clearly don’t have any conscious, hope karma comes back to them. Your firm “No.” seems completely reasonable, it’s your sale in the end. Perhaps reposition yourself so you can see inside your garage while cashiering on the sidewalk. Folks will not be neat if they know no one is watching. I myself wear a lumber yard apron with all money in a money bag so I am free to walk around and survey every area at any time during the sale. When I get over $100 profit I put it inside my pants pocket so it is separate and during the next quiet time I put it inside of my locked house and repeat throughout the day. I believe the “gang” knew exactly what they were doing to you – they are well practiced. Best thing to do is start yelling loudly for them to leave and attract attention from others on the street so they quicky scurry away! They won’t bother you again after that. People are people the World around.But you did manage to rid some items for cash.Even in thrift shops and the landfill,people still persist in being difficult and you have to stand your ground.Your storage area did look a mess and at least Sarah helped for a while.In future,you should have 2 people working a sale and perhaps make sections for the same priced goods,leaving the collectables closer to you.I enjoyed your story and look forward to your adventures.Happy Hunting. UGH, sorry you dealt with such lowlife people. It sounds like it was a group working together. 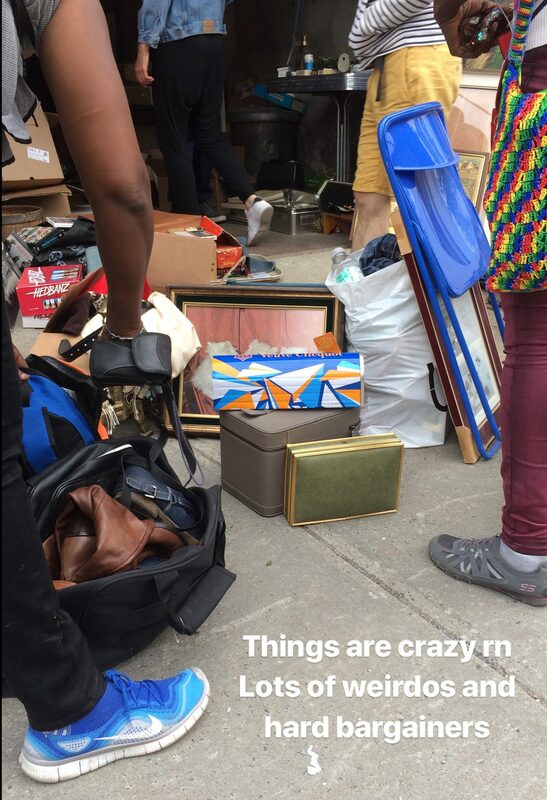 There is a certain group that targets yard sales in our area…they also hit up the Goodwill bins in “teams” so nobody else can get anything from the new bins. At least that store has hired security. In the future, definitely have a second person and maybe some dummy cameras set up around the garage in obvious spots. It sounds like they possibly created chaos as a distraction for stealing smaller and more valuable items? 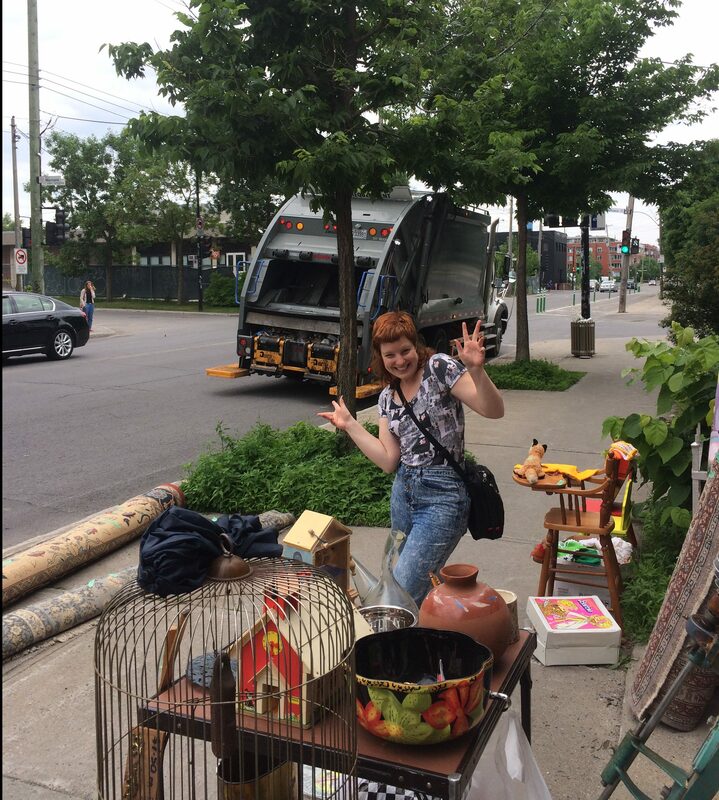 You have been quiet about posting your moving day finds.I have been semi-active in scavenging the trash the past 15 days,looking for moving day finds.Did find some useful stuff but not big,big treasures.I found lots of unopened cosmetic items in black trash bags in cental Ahuntsic and took them home for use including bottles of Dove body wash,two unopened bottles of perfumes,Neutrogena shaving lotion,cosmetic jewellery,sunglasses,etc.Near downtown I found in a plastic trash bin six vinyl records,including one with the soundtrack of Charlie Chaplin’s famous film MODERN TIMES.I also found lots of spools of yarn in the Southwest borough,a great tennis racket and a black trash bag full of 10 dollars of aluminum soft drink and beer cans.The list goes on.It was too hot for me to scavenge for long during the heatwave,but I salvaged many good things just 5 minutes before the garbage trucks came in many cases. A lot of the good stuff had already been taken by eager,businesslike scavengers but some good stuff remained if you cared to poke around long enough.I must have scavenged 40 Streets in the last 14 days,but that is not much. Did the excessive heat make scavenging difficult for you? Nice finds, glad you could make it out. Yes, the heat definitely made things difficult in those busy days. I had planned on biking around more, but I really couldn’t motivate myself to! Thankfully my car has air conditioning so I toured around a bit that way, trying to find places where there might be richer people who moved and also less other scavengers (there’s a lot of competition on moving day, unlike any other time of the year). I found some decent but unspectacular stuff in TMR and Old Montreal. Ironically, after all that travelling around I ended up finding my best finds around 30 seconds from home. I’ll post about it soon! I have been very busy picking and switching garages.